If you’re thinking of giving your bathroom a makeover, there are many details you’d need to keep in mind from the color of the walls to the accessories. When it comes to the color, most people would opt for something neutral or blueish so as to symbolize water. However, if you’re looking for something bolder and with a bit more personality, consider the Pantone’s color of the year ‒ ultra violet. If you’re not sure how you could introduce such a lively color into your bathroom décor, here are a couple of ideas. First things first, if you want to use this color correctly, you should know what it means and why it was chosen as the color of the year. Pantone has described the color as “an enigmatic purple shade that evokes the inventive spirit and imaginative thinking that challenges the status quo.” In other words, it is a color that emphasizes the sense of mystery, originality, creativity, non-conformity, ingenuity, and curiosity. In this sense, this dramatic shade of purple sends a message with a deeper meaning that goes beyond its appearance. If you are a bold type of person who is not afraid of standing out, consider painting your bathroom walls in this color. In addition, since it is a color that has been associated with royalty, you can also introduce some gold decorations and accent features to further emphasize this theme. Also, if you’re aiming for something a bit more regal and rich-looking, you should also embrace minimalism, as a cluttered bathroom can’t exactly be considered “royal”. If you’re feeling extra adventurous, why not install ultra violet fixtures as well? There are many amazing showers, toilets, baths, and bathroom sinks that can come in any color you wish. Plus, some of them can even have purple LED lights installed so when the water flows from your showerhead, for example, it will look purple as well. If this sounds like something you would love to have, there are many quality baths offered by Acsbathroms, so make sure to check them out ‒ you will definitely find something that will fit your needs. Moreover, your shelves, countertops, and hangers can also be in this color ‒ and you can add accessories in a different, complementing shade in order to create a truly stylish theme. If you’re not into painting your whole bathroom purple, consider adding ultra violet accessories. For example, you can have towels, toothbrushes, and soaps in this color. There are also many shower curtains and soft bathroom mats that can be found in ultra violet. Moreover, if you’re looking to create a relaxing ambiance, you can find many beautiful scented candles in all kinds of colors, including this one. So, even if you can’t afford to paint your walls in this regal color, don’t hesitate to spice up your bathroom a bit with a couple of ultra violet accessories. If you can’t actually paint your bathroom in this lively color, why not simply create an illusion of it? You can install a couple of ultra violet LED lights in your bathroom, so every time you turn the lights on, your bathroom will appear to be in this beautiful color. Sure, it might be considered “cheating” as it’s not exactly a part of your décor, but you must agree that it is quite a unique way of enhancing your bathroom and creating a mysterious and romantic atmosphere that is perfect for relaxing bubble baths. 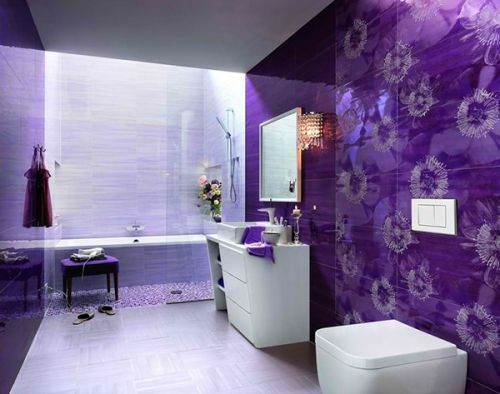 If you’re looking for a way to upgrade the appearance of your bathroom, consider spicing it up with ultra violet. It is a lively color that can bring the visual appeal of your bathroom to a whole new level. So, consider the fixtures, paint the walls purple if you can, introduce a couple of purple accessories, and you will be enjoying long, calming baths in this gorgeous color in no time.